And poked it with a pin. And stole a leg of lamb. And filled his shoes with clay. And beat him on the head. Here's a Mother Goose rhyme that I first heard in Richard Scarry's Best Mother Goose Ever. I could never figure out why the guy felt like he could call Taffy names like cheat and thief, when he did just as much bad stuff to Taffy. I also didn't know what being a Welshman had to with anything (or really what the word meant at all, since I wasn't really aware of Wales at the time). Mom told me something to the effect that it was a rude poem, and that I shouldn't repeat it, which just made it more mysterious. I eventually learned that Taffy is a generic not-especially-polite name for Welshmen, much like Paddy or Mick for Irishmen. 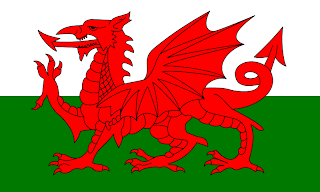 Evidently, it's sung on St. David's Day in England, especially near the Welsh border. Wikipedia claims that it's referring to a thief in Celtic Mythology, but I'm pretty sure that whatever its origins, it has come to symbolize and summarize the relations between England and Wales over the years with various border raids and conquests. I still think what I thought when I first read it: if these guys would just stop being mean to each other, they'd be happier. They have that Richard Scarry book in the nursery at church here. Scandalous. Doug just told me that "Taffy" comes from the Welsh pronunciation of "David." The welsh spelling of David is at least this: "Dffyd" or possibly worse. Love this little nursery rhyme. I read it often for an easy laugh. I love this little nursery rhyme.